The computer is nowadays the most frequently used device, hence it requires the user’s special care. With our product, you will ensure its ideal cleanliness and the appearance of newness. In addition, the product cleans all kinds of plastics. Thanks to a careful selection of detergents, it removes dirt from plastic surfaces quickly and effectively, leaving a pleasant aroma. 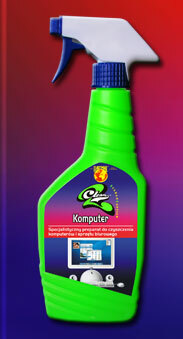 The product is commonly used in the largest European offices. It is also a mandatory element of the technical services’ equipment.